The top patisserie for Afghanistan wedding cakes is Razavi Patisserie, found right in Sharenau, the main business district of Kabul, Afghanistan. 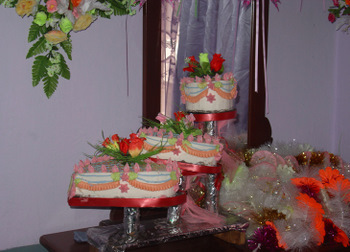 In Afghanistan culture, all weddings must have a proper cake. Ravazi Patisserie caters to this market. There are bakeries and patisseries all over the main cities and villages of Afghanistan, but this shop is special. Mr. Razavi is from Ghazni, and he is the one who started this shop. He learned cake baking and decorating in Iran. He said that while he has good business, rent is expensive, and of course he does support a family with his business. A typical week this patisserie caters to 3-4 weddings. Recently, he has started making and selling long 3-layer ice cream "bars" approximately 2 feet long and 4 inches wide to complement the cake. He slices the ice cream into approximately 1" slices. He sells these for 900 Afs and one "ice cream bar" would feed 20-30 people. Afghanistan wedding culture is different. Cakes are sold by the kilo. The average size sold by this shop is 20 kilos of cake, 350 Afghani per kilo. At 50Afs/$1, this translates to 7000 Afs per cake. A 20 kilo cake usually takes 30 eggs, 5 kilos of Iranian Cream, and 7 kilos of sugar!